Selecting the proper trees for your home’s landscape is an important part of the design process. At Landfare Ltd., we take into consideration your lot size, adjacency to your home or other structures and how you may want each type of tree selected to perform. Are big shade trees important, or do you prefer evergreens? Many of our clients want to ensure their trees provide a healthy habitat for birds. And nearly every one wants their landscape to provide a colorful show in the fall. We’ve selected a few of our favorite trees, all that will give you that prototypical Ohio fall foliage display that announces fall. Red Sunset Maples are beautiful throughout the year: winter buds, clusters of small spring flowers, stems and winged summer fruits all in a striking red hue. But when fall leaves burst out in red and orange, the result is show-stopping color that really epitomizes the perfect fall display of color. 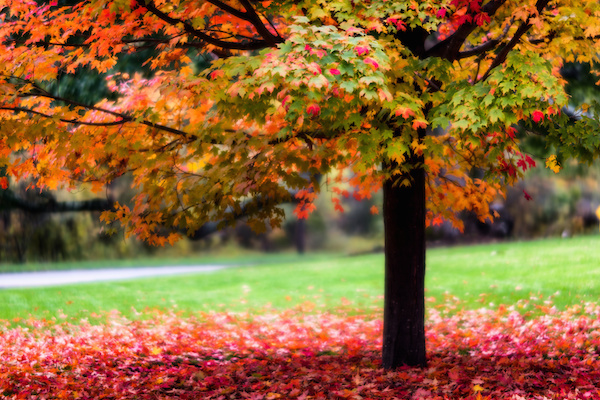 The Red Sunset is a large tree – 454 to 50 feet tall with a 25 to 40 feet spread – and while it offers wonderful green leafed shade in the summer, it’s the fall foliage that makes the biggest impact on your landscape. For this home, we added climbing hydrangea to the chimney to create a balance between the tree to the right and the lower landscaping details. Although the hydrangea was not in bloom at the point this photo was taken, it will feature large, fragrant clusters of white flowers that bloom in late spring and summer against a backdrop of dark green, heart-shaped foliage. These vines climb columns, trees, and other supporting structures. A climbing hydrangea plant grows 30 to 80 feet tall, but it tolerates pruning to shorter heights. The Landfare Ltd. approach to design is very specific: we design and create outdoor living spaces that look and function beautifully, and transcend time or trend. 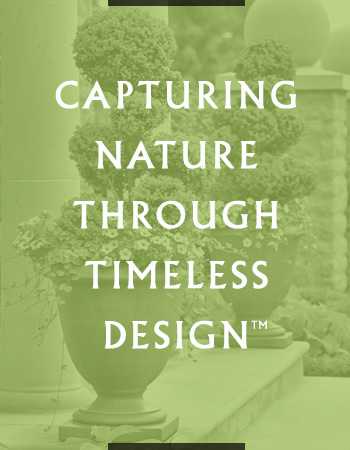 Our motto, Capturing Nature Through Timeless Design™, tells the story of what we do. When we begin creating a landscape design we consider the home’s architecture because we believe outdoor living spaces must enhance, not fight, with that architecture. We look at the home’s interior design and the choices the homeowners have made because we believe moving from indoors to outdoors should be a seamless transition. The selection of hardscape materials like pavers and bricks should look as if they have been part of the home’s design from the beginning, not an afterthought. Pools, spas and water features should help create the ambiance not distract from it. Planting materials must work together to bring color and life to each season. As homeowners update or renovate their homes, our landscape design evolves, too. New exterior structures, like garages or home additions, demand a thoughtful approach to enhancing the original landscape design. Through our long-term relationships with clients we are able to collaborate with them to create new outdoor living spaces and landscaping that evolve with the owner’s vision for their home. 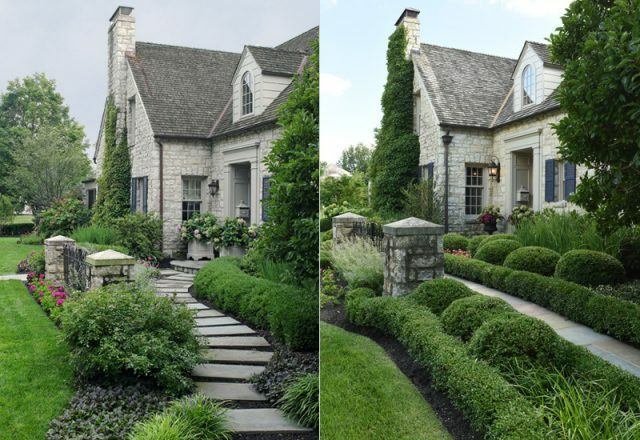 This home’s original landscape design, as seen on the left, was installed about 10 years ago, and continued to look very appealing. But the homeowners embarked on an extensive renovation that included an addition to the home. The new design, on the right, adds balance to the home’s architecture. The original gate and columns remain with a new bluestone paver walkway that leads directly to the front porch. The differences are substantial yet subtle, giving the home timeless curb appeal. 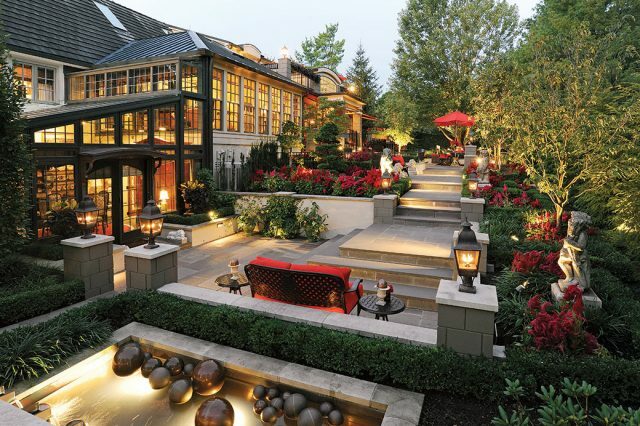 Just as interior design choices evolve, so do landscape designs. We think of it as a lovely symphony of design selections and professional installation that work together to create timeless outdoor environments for our clients. Each piece is carefully selected to ensure a beautiful finale! 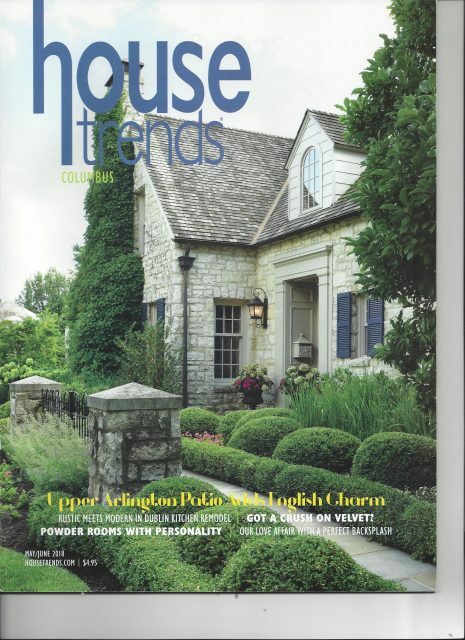 Our complete redesign of a long-time Upper Arlington client’s property was featured in the August 2018 issue of Housetrends Magazine. Elegant and timeless design make each new feature blend seamlessly with the home’s architecture. The article shared some of the photos taken by Dan Feldcamp during the magazine’s photo shoot, but not all of the beautiful photos, so we created a gallery to showoff all the photos taken. See all the photos here. You can also read the article here. 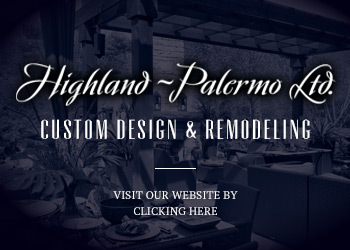 Many of our clients ask us to design and build complete outdoor living and entertaining spaces: patios, pergolas, water features, outdoor kitchens, fireplaces and, of course, gardens, planting beds and lush landscape. For many clients, a swimming pool, pool house and water play area fit in naturally with our designs and the client’s wish list. 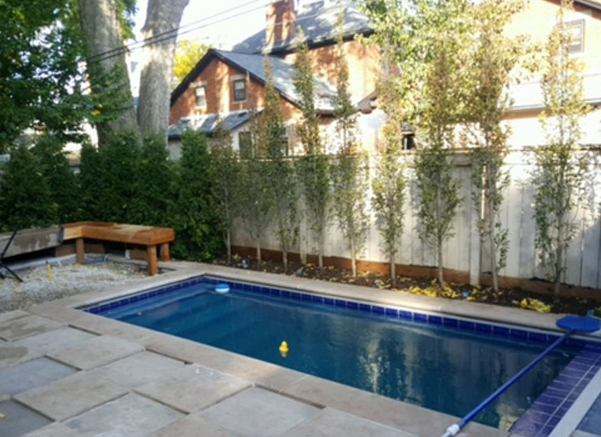 In the past, we worked with our sister company, Blu Pools & Spas, to design and build swimming pools for our clients. In order to give our clients seamless service, Landfare Ltd. has recently acquired Blu Pools & Spas. The same design/build team will be working with Landfare Ltd. so existing clients will see no difference in the service they receive. We are excited about this wonderful opportunity to continue giving our clients the highest level of service as we create the outdoor living areas of their dreams. Each landscape project Landfare Ltd. designs and installs follows a philosophy that acts as a guide through the entire project. The goal is to create outdoor living and entertaining spaces that match perfectly with the esthetics of the exterior of each client’s home and the interior design choices the client has made. Going from the indoors to the outdoors should be a seamless transition, and Landfare Ltd. designs achieve that goal. 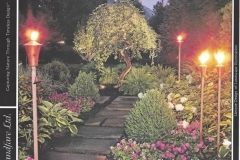 To make sure that transition works day and night, John Spayde, Landfare Ltd.’s designer, created the Seven Levels of Illumination,™ the company’s approach to lighting. This design concept considers each outdoor space, including the living areas, the property, all gardens and landscape, and the house itself. For this client, Paradise Found is a secluded area surrounded by lush palms, trees and ferns. A place where they can totally escape from the hectic pace of everyday life. A place to relax with a glass of wine, the only sounds the soothing trickle from a water feature. Just peaceful quiet. What is your idea of Paradise Found? Maybe a full service outdoor kitchen, or pool area for your children, or maybe a fireplace to keep you warm on chilly nights. What we do best is translate your ideas into designs and make those designs a reality for you and your family. 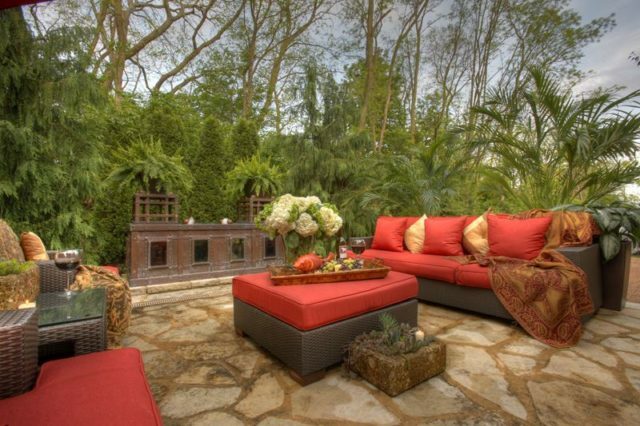 Landfare Ltd. has a definite vision for the outdoor living spaces we design for our clients. Part of that vision is that all our work enhances the client’s home. Our designs and all the elements we incorporate – water features, pools, spas, landscape – all work together to project the pride our clients have for their homes. We never create trendy or ostentatious designs that conflict with the home’s architecture and property. While discussing this vision as a team, we agreed that we really project Quiet Pride™ in both our own work and our clients’ homes. Designing outdoor living spaces for our clients encompasses multiple disciplines including garden design, hardscape, landscape, water features and illumination. At Landfare Ltd. we take great pride in how we approach each discipline, and work to ensure our clients enjoy every facet of the spaces day and night. 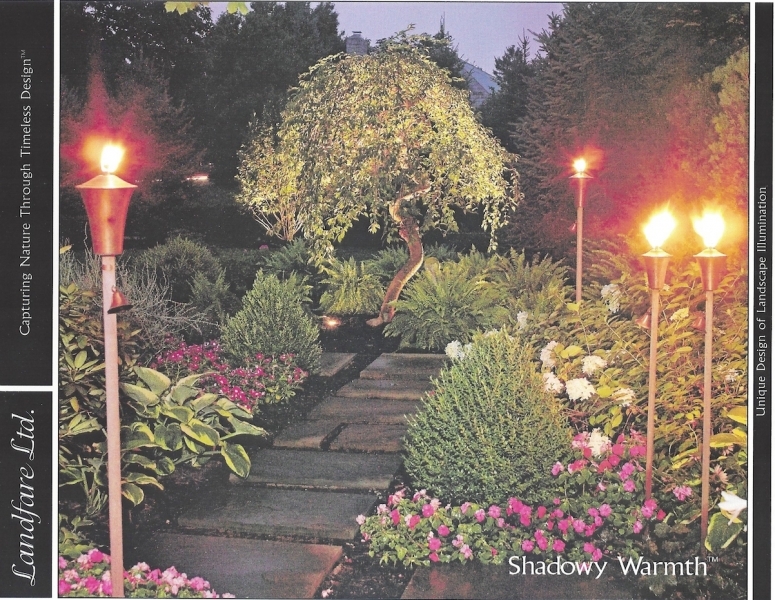 Evening is when you can really see the effect of our illumination designs. In fact, the Seven Layers of Illumination is a standard we include in every design. 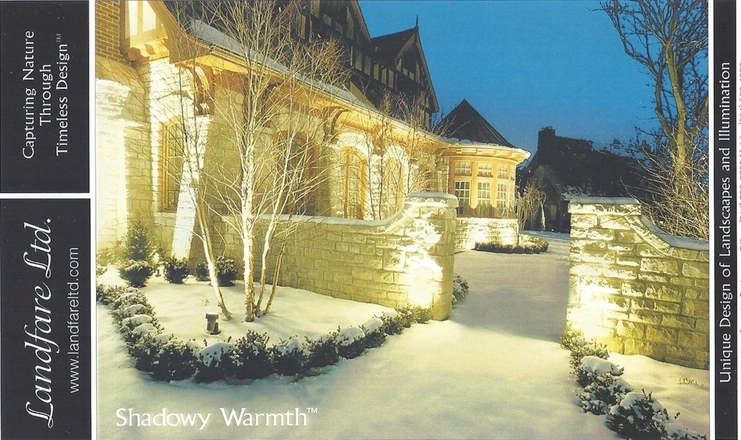 We coined the term Shadowy Warmth™ to describe the impact well designed lighting can have on your home. 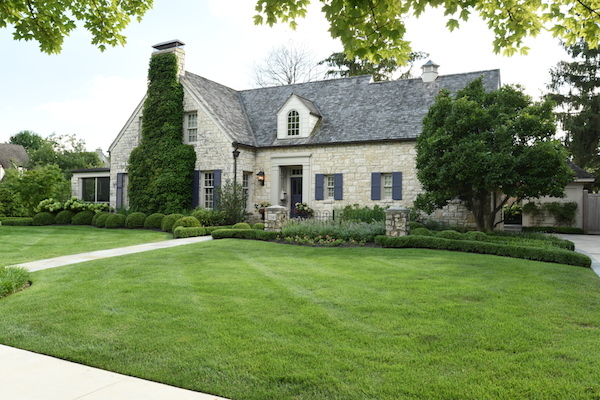 From highlighting architectural details to lighting pathways, focusing attention on specific plantings to creating tree-lit driveways, using the correct lights for every level is critical. Illumination makes your outdoor living spaces come to life after the sun goes down. 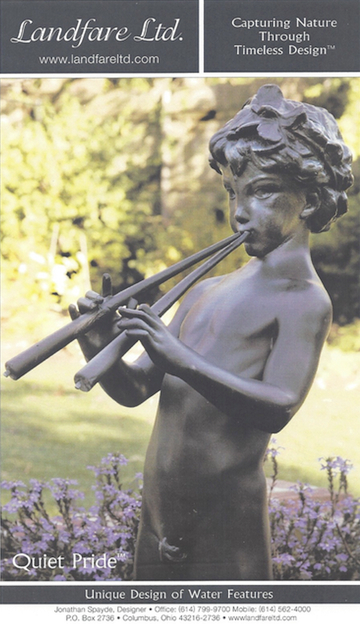 They bring the drama to your home and landscape! The Landfare Ltd. approach to design is very specific: we design and create outdoor living spaces that look and function beautifully and transcend time or trend. Our motto, Capturing Nature Through Timeless Design™, tells the story of what we do. When we begin creating a landscape design we consider the home’s architecture because we believe outdoor living spaces must enhance not fight with that architecture. We look at the home’s interior design and the choices the homeowners have made because we believe moving from indoors to outdoors should be a seamless transition. We think of it as lovely symphony of design selections and professional installation that work together to create timeless outdoor environments for our clients. Each piece is carefully selected to ensure a beautiful finale!